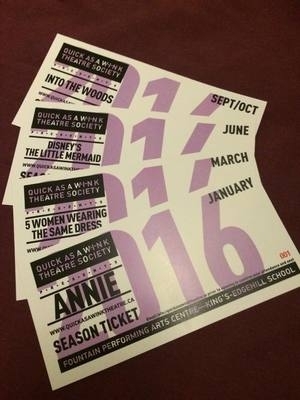 Quick As A Wink Theatre Society's Community Partnership program is an opportunity for local businesses to partner with QAAW by claiming blocks of tickets to be given to local community groups. Businesses also receive a pre-determined number of the newly introduced Season Ticket packages they can use to reward employees and clients. Members of the public are able to purchase Pay It Forward Tickets, which QAAW will match before awarding the tickets to local community groups, doubling the amount of community members exposed to the shows. QAAW's has a longstanding commitment to making arts and arts education accessible to the Avon Region and beyond.